One case of male youngster, came with Leucoderma problem 350 kilometers away from KANPUR at our center before 5 years, when his age was 12 years.. The boy was having problem of Leucoderma , while he was 8 years old and was treated by Allopaths for a long period.without any results. During treatment period, the white patched aggravated and spreads in some parts of body. The boy first visited in year 2013, SEPTEMBER and his treatment is continue still with slow progress. At the time of the start of the treatment his photographs of located main leucodermal spots and patches are given below. His monitoring of disease condition and progress is compared with the earliest taken photographs. Last time his photograph is taken on 30. 03.2018, and is given below. Although majority of patients response rapid and timely as expected by Ayurveda Ayush remedies, but it is seen that 1 or 2 percents patient responds slow with Ayurveda Ayush remedies. This boy is taking much more time for curing process. Generally in our research center Leucoderma cases have been cured from days to one or two years. The fastest cure we have recorded of 28 days, a younster from Bihar Patna cured in this period. Other patients responded slow and the reason is many, which is found individual to individual. One 8 years girl came for vitiligo treatment 11 yesr ago, who is having white patches in her whole body and a big one in her upper part of foot. Still her treatment is given and her all body white patches have cured and no traces of the patches in her body except a smaller patched on the upper foot in both legs. Now she is 19 years old and her treatment is continue. She have some allergic problem since her childhood when she was 4 yrs old. She was given Allopathic treatment and after that Leucoderma patches appeared. Presently she affected with the allergic reaction, whic causes severe Laryngitis and pharyngitis with bronchitis particularly in Winter season. This is might hurdle to her for rapid and earliest cure. The speed of cure cannot be accelerated by any way because in our center it is tried for earliest cure. On request of one patient, for rapid cure some procedures were adopted but this reverses the process of cure and as a result patient body became full of white small patches and to control these patches all procedure failed and in-vain. After this case we did not try for faster or rapid cure. In my experience and observation, one thing is prime that once LEUCODERMA patches are filled by Meline and natural color and the process of cure is naturally set-ups, a total cure of LEUCODERMA is assured 100 percent without any failure, apart from time limit. therefore, we do not disturb the process of natural cure by any extra addition of faster cure remedies or do not like to interrupt the natural way of healing by any extra means. I am sharing my experiences about the AYURVEDA and AYUSH Therapies TREATMENT of ”TUBERCULOSIS” particularly of PULMONARY or say of Lungs with comments on other kinds of Tubercular infection.. I remember when I was a child and my father VAIDYA Late Shri Shitala Sahai Bajpai, Vaidya Bhushan [Banaras] was parctising Ayurveda and Homoeopathy simultaneously because he studied Ayurveda in Banaras and Homoeopathy in Calcutta. It was the time of the British Government. My great Grand Father Vaidya Late Shri Shiv Mangal Bajpai was very keen to practice Ayurvda and he want that may father practice Ayurveda , but my father was more impressed to Dr Kali , a well known and famous Homoeopathic physician of Maiman Singh and Kanai Ghat areas in year 1940s period, now it is a part of Bangala desh at movement, across the Padma river. Over all my father was very keenly practicing Ayurveda and prepared himself the Ayurveda drugs at home. In my childhood I saw attentively, how my father diagnosed the patient and told them the certain remedies to be taken carefully with life style and eating habits. When my father attended TUBERCULAR patient , he look the sign and symptoms as narrated in the Ayurveda classical books and matches with them. The syndromes were like as under mentioned. 6- In Ayurveda the disease is termed ”RAJ YAKSHAMAA” in हिन्दी ”राज यक्ष्मा”. Raj means the Raja or King. The concept of the term denotes that the disease condition is over all the physical and mental disorders found in the body over lapses to all and is supreme to top of mentioned disorders in the diagnosis books of Ayurveda. 7- The syndromes narrated in Ayurveda is similar to the diagnosis of Modern medical system but the disease is categorized accordingly to principles of Ayurveda for much finer diagnosis in view of the treatment. Modern Medical system considers that the Tuberculosis is happen due to the invasion of ”Tubercular bacillus” in human body, which is entering through the infected persons or animals. like Cow and dogs and other pets or infected person of tuberculosis. Comparatively Ayurveda considers that the person who are over working , having weak constitution, long suffering from the devastating physical and mental disorders, lower vitality, living in unhealthy conditions, improper diets and other exhausting disorders like anemia etc. 1- Have you fever ? at what time ? 4- How much you eat in a day ? When I was a student of AYURVEDA in 1964, I used to go to see the practices of the master prescriber and practitioners of AQYURVEDA ad Homoeopathy and Unani Hakims in Uttar Pradesh and outside of the state. I want to eager to know , how these practtioners tackle the cases and treat them. I spent a day or two or three or more and watches them about their diagnosis and treatment including followups patients. This was the time when Allopathic doctors uses Streptomycin and dicrysticine for the treatment of Tuberculosis patients. Some others dour or five drugs were used like Isoniazide, Rifampicin, Thiambutol and to check heamorrhages Styptovit tablets and injections. Cod liver oil or Shark liver oil imulsions of the choice of allopathic doctors, who opins that this strongs the Lungs. To confirm the tuberculosis, X-ray and Hb% and ESR and TLC.DLC and Montoux test was the primary choice of the Allopathic physician, then it is diagnosed whether the person is affected tuberculosis or not. But in Ayurveda these all tests and examinations are taken for diagnosis purposes and later monitoring the progress of disorders. For Ayurvedic physician, it was important that what is wrong in Prakruti and TRIDOSHA and Tridosha five kinds and SAPTA DHATU field. After considering the all facts, AYURVEDICIANS prescribe remedies , which were selected accordingly to the condition of patient. Ayurvedic physician first tries to eliminate the commencement of FEVER, because they consider that FEVER is the reason of the complaints. For that they uses appropriate remedy to neutralise fever. When fever minimises the complaints of the patient minimises in the same ratio as above mentioned syndromes. Later I treated a large number of tubercular patient of Lungs with Bone TB, Tubercular meningitis, tubercular infected kidney, intestinal TB and similar other complaints with AYURVEDIC, HOMOEOPATHIC, UNANI and life style management. At present tubercular patients are seen and in some cases I wonder that the expert physician could not traced out the infected person. I have arrangement in my PATHOLOGICAL LABORATORY to test at least a major number of bio chemical chemistry only for diagnosis purposes for patient only. My personal observation is with the infected Tuberculosis patient that Nitrite reaction is very fast with the blood serum of patient and goes fastly from .30 to 1.70 in photometer readings within few minutes. The Zinc level is higher and the Stannum level is very higher seen in the tubercular chronic infected patient. An Ayurveda supplement of Zinc and Stannum contained drugs helps patient to minimise the syndromes. Ayurveda physician helps patient to maintain the physical structure by eating nutritious food like meat and milk products and milk particularly of Goats. Once patient is cured by Ayurvidic remedies, it never relapses again as I have seen. Those got cured is warned not to do the similar acts and prevent from those cause, which makes them ill.
Cook and Boil in 125 milliliter water up to one hike just like tea and keep it as it is in a place and watch for lukwarm stage. should be taken with Honey and after that drink the above mentioned decoction. LEUCODERMA / VITILIGO / WHITESPOTS /SAFED DAAG might be understood an incurable disease condirion in Allopathic Medical system, but this is a curable and total curable disease condition and disorder, if it is treated by AYURVEDA and AYUSH systems of medicine and specially if treated on the findings of the newlt invented Ayurveda-ayush technology E.T.G. AyurvedaScan and Ayurveda Blood Urine examinations findings, a total cure is assured. Below is given photographs as evidence to readers, interested in Ayurveda and Ayush therapies , a 6 yrs male chiled suffered Leucoderma last one year. Last year her parents belonging to URAI , UP, distance from Kanpur to Urai is over 180 kilometers away, visited our clinic in March 2017. His ETG AyurvedaScan in resting position and relax and sleep position was recorded with Urine complete analysis of electrolites and minerals substances. At the same time a photographs was taken for record and that is given below. See the extension and origination of white patches starts from the margin on upper lip right side, extending towards the nose and nasal cavity. 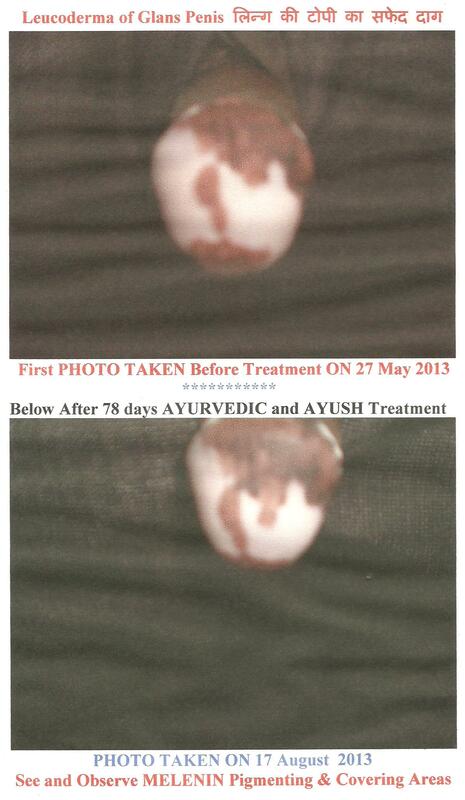 This photograph is taken in March 2018 and see the comparison after the Ayurveda and Ayush combination and integrated treatment. The changes are visible. Margin of right lip has changed in skin color and melenin has been covered the area, which was not seen in earlier photograph. Changes are seen in the area of the affected parts, narrowed down than earlier. The boy has examined for followup and his Urine examined for electrolytes and minerals evaluation. Remedies has been suggested for SIX months. In our establishment, LEUCODERMA patients have been treated in very large number. All have got relief and cure in their ailing conditions. It is observed that every Leucoderma patient have some peculiar features in his complaints and body have some specific features individually. No two LEUCODERMA patients are having equal physical and mental and pathophysiological and pathological anomalies. Every patient have their own and individual identical problems. In our center, examination and tests are done for procuring the data of the individual patient and their related connected local and diastal extended anomalies identification studies. Success is achieved after the conclusion of the patient individual problem. Success in treatment is depend on the specific studies on this line. Chemicals and minerals base Ayurveda drugs are used in Ayurveda treatment and management since centuries. Ayurveda remedies were developed by Ayurvedicians, practicing the indigenous science of healing. The development of the healing Ayurveda science practiced for gaining long life , say over 120 years, with the ultimate goal of life , for obtaining dharma, arth, kam , moksha etc which was at that time primary concept of life. This was the era of philosophy and Vedas compilation. In my opinion, those learned person, who studied ATHARV VEDAS, they have got the concept of the power of the Earth properties, like Air and Water and Sun and Space and Earth etc. ATHARV VEDA scholars know well at that time about use of healing herbs for curing ailments like fever, cold and coryza and pain etc. Some of them among, were practicing ASTROLOGY with the study of Atharva veda , apart from practicing healing art, they named the style of healing art AYUR VEDA, which is a combination of two words Ayur and Veda, that literal means ”knowledge of Life”. This way the development of Ayurveda turns into science and with the progressive time, knowledge about herbs uses and minerals and animal substances medicinal use , was groaned with the practice and their results. Presently , Minerals origin and vegetable and plants origin and chemical origin and animal origin prepared drugs are using in Ayurveda practice. ”Fe”, [ short chemical formula] a chemical substance, uses in chemistry analysis, is known as ”FERRUM” in Latin and in English ”IRON” and in Hindi लौह अथवा लोहा, which is a widely used chemical substance in our life , is also uses in Ayurveda, which first recognizes the importance of Iron for human body. In Ayurveda , Iron formula bases remedies segregated in a volume, where different herbs and minerals and animal kingdom substances are mixed with LAUH BHASMA, that means Iron in form of oxide, specially prepared by process of Ayurveda, which is mentioned in Ayurvedic formula books. These are known as IRON BASES DRUGS or say लौह घटित दवायें. 3- Mix all well with a little quantity of fresh water, grind in mortar and pestal continue up to dry. This prepared drug is taken in 250 milligram to 350 milligram quantity or according to the need of patient, decided by the Ayurvedicians, mixing five drops of COW GHEE or 5 drops of liquid Butter and half spoon HONEY, mixing well and should be taken Morning and Evening in empty stomach. After operation of eyes or implant of glass, if any problem arises, this corrects it. I have used in many patient , who complained several kind of problem after cataract operation. This drug corrects almost all problems. All those pathophysiological and pathological disorders, which arises from the base of neck to the vertex of head are covers by this remedy. My view is to share with you all that minerals bases Ayurveda remedies act fast because our body is made of the chemicals substances and direct taken chemical bases remedies acts fast in human body. Haundreds of thousands Ayurvedic Formulas have been mentioned in Ayurveda Classical texts from the time of Charak, which are still effective after the passing of a long time, which astonishes us. Simple muscular and complex muscular disorders or disease condition, whatever nature of the muscular system disorders diseases, they can be well treated by Ayurveda-ayush combination and integration. Nomenclatures and titled so called muscular system disorders come under the treatment. In medicine classical literature there is description of a large number of muscular disorders’ division are seen. They are categorically listed in various chapters, with a details from atiology, pathophysiology, pathology . treatment and management etc. An overall view can be scored and divided in few numbers  muscular pain, which could be of various sensations  shortness or contraction of muscles or muscle fibers due to any reasons  deposition of any substance in muscles such as fat, minerals, blood or any substance, which inhibits the work of normal muscles physiology  complex muscular problems due to nerve involvement in muscle pathophysiology or muscle problems with autonomic nervous system, which could be of any reason or pathophysiology or pathology of others organs remotly affecting muscles physiology. some times the problem is related with the involvement of neuro-musculo-skeletal organs. This is a very complicated problem arise to patient. In this condition Muscular system and nervous system and skeletal system all three system involved including Blood and circulatory system. In Ayurveda and Ayush therapies treatment is possible of all three conditions , if not too long disease condition. Ayurveda-ayush ways of Diagnosis and according appropriate Ayurveda-ayush treatment and management cures / relieves the sufferings, which patient have and patient passes a comfortable life without any serious set-backs. Our experience is bases on the line of the treatment and diagnosis through E.T.G. AyurvedaScan examination and Ayurveda Blood and Urine tests findings. A wast report gives a clear diagnosis,what is going wrong with the patient. The chemical chemistry of patient body indications are matches and compared with the electrically scanned areas, obtained by ETG AyurvedaScan [ three types of scanning ] to conclude, what type of treatment and management patient is required. After that a prescription is given to patient which includes Ayurveda and Homoeopathic and Unani remedies and instruction, what to do and restrictions and management with the life style. Generally patient condition improves after four months treatment, but some requires more weeks for complete sure or relief. AYURVEDA and AYUSH remedies are total safe and have no side effects of any kind in body. Classical Ayurveda and classical Homoeopathy and classical Unani remedies have potential to cure these MYOPATHIES conditions. The basic reason of this disorder can be Psychological, Physiological or Endocrinol or imbalanced Chemical Chemistry of patient body. Genetic history patient can also be maintained by Ayurveda-ayush treatment and a prevention is possible. MYOPATHIES or MUSCULAR or NEURO-MUSCULAR or NEURO-MUSCULO-SKELETAL disorders of any kind can be treated well by Ayurveda and Ayush treatment. Disease-history of many complicated patient showed that these patients are not well known about the AYURVEDA and AYUSH treatment and management and were taking the treatment where cure was not possible.